The Late Adopter also has video here. Bucky Turco has more at Animal New York. My guess is the security cameras are worthless. It's winter. I'm sure the taggers were wearing dark winter coats and hats and scarves and gloves.. i.e., NO revealing identifiable features. Maybe in summer the cameras would be somewhat effective. The harsh lesson; don't assume any public art work will be respected and left alone. 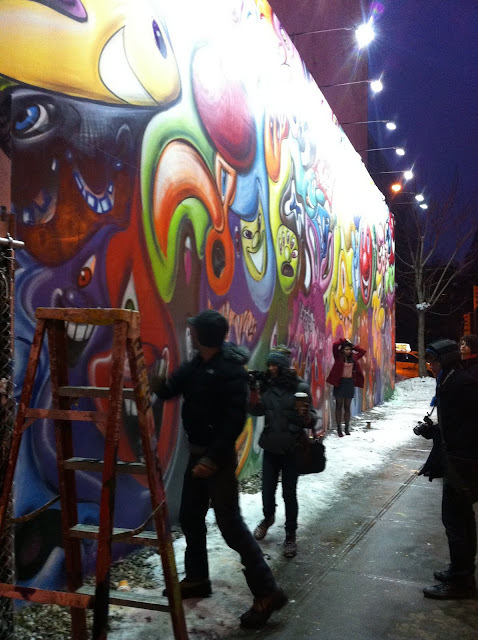 Now it's on Bowery residents to cane the legs of any taggers they spot.